Your Website is a Valuable Asset. Protect It Today. Hosting: If your website is loading slowly, you are losing potential customers. Our hosting includes our lite-speed service. We are the fastest local hosting company, and you get personal service. If there is a problem, you talk to a real person every time. We also offer free hosting migration from your current hosting provider, with speed optimization for your website. Mobile speed is an crucial SEO factor as well as an important part of your customer’s user experience. Our lite-speed hosting with Cloudflare allows your site to load quickly regardless of the mobile carrier or where your customer is located. Security: Many small business owners think that a website hack is unlikely. Why would someone want to hack your small business website if you do not take credit cards or store sensitive information? It’s very simple: to make money. The two most common hacks for small businesses may not affect you but they can affect your visitors: link spam and malware. Both are very costly to small business owners. It’s sad but true that attacks against small business websites are increasing every year. In fact, 43% of all cyber attacks are aimed at small businesses, costing thousands in lost business, lost time, and lost reputation. Backups: Problems can happen for many reasons with a website. Maybe you login and make a change to a page, only to find out that the change broke something else. Perhaps a theme or plugin update messes up the design or functionality of your website. Or, worse yet, a hacker inserts malware into your website. These things happen all the time. The quickest way to get your website at full functionality again is to restore from a backup. With our hosting program, we back up your website continuously, making it simple to restore your website should a problem happen. 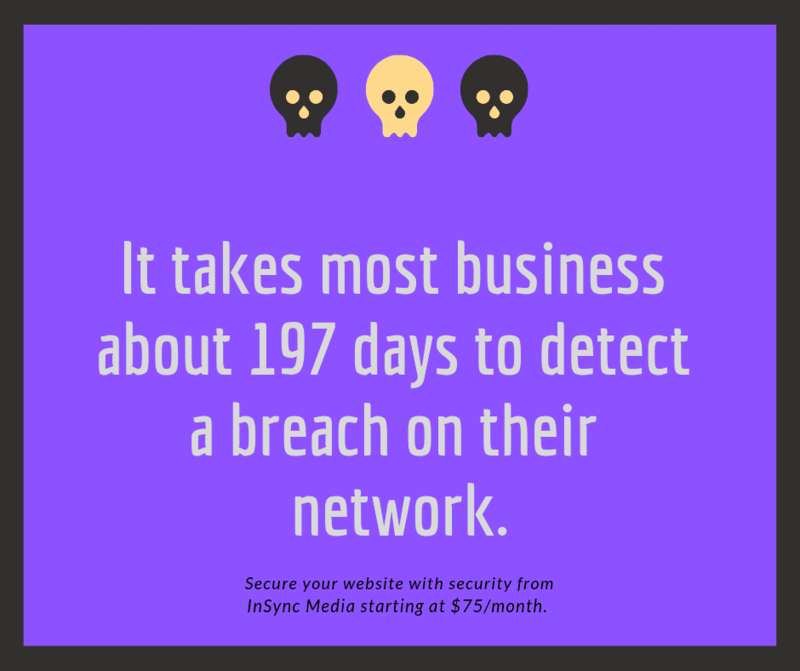 Protect your business and your customers with InSync Media’s hosting and security program! Custom pricing available for e-commerce, health care, civic, real estate, or websites over 10 GB. Bulk pricing available for multiple websites owned by you. Get Started With Hosting & Security Today! Your website is ultimately your responsibility as the site owner. Our hosting and security contract defines the scope of our service and limits our liability in certain events. Please read our terms carefully. The following is a brief summary and the link to the full agreement is at the end. We agree to host your website, perform backups, update your theme and plugins, optimize your website for speed one time, and maintain industry-standard security protocols on your website and our hosting servers. If there is any issue with your website related to our services (hosting, backups, security, updates), we agree to fix the website back to the original working order within 24 hours of the problem being identified to or by InSync Media. If we deem the issue will take longer than 24 hours, we will let you know as soon as possible. We include a two (2) hour per month credit towards any of the above mentioned fixes without any additional charges, with the max credit of six (6) hours per twelve month period. We may charge you an hourly rate for any time over the two hours per month or maximum six hours per twelve months. We provide complimentary support to you. Please take advantage of that if you have questions about adding anything to your site that may affect the security of your website and our network or slow down your site and incur additional charges to your account. You have full administrative logins to your website and hosting accounts (if requested). This means that you or anyone you give login access to has the ability to make changes which could compromise the security and stability of your website. We are not liable for any loss of income or reputation (real or perceived) during the time your site is down due to non-payment, a security issue, downtime on our servers, issues with third-party plugins, issues with updates, or any other issues. If you or someone you authorize causes any issue on your site related to our Service knowingly or unknowingly that InSync Media has to fix, this is not covered by your two hour per month credit and will be billed at our standard hourly rate. You agree to inform InSync Media before installing new plugins to your site as some plugins may affect the security of our entire server network. Unless other arrangements have been made (such as a discount on a bundled package), this is a month-to-month service; no long-term contracts. You agree to keep a valid credit card on file and not initiate a chargeback for our hosting services. If your account becomes delinquent, we have the right to stop hosting your website after reasonable attempts to contact you for payment. If you wish to change hosting providers away from our hosting, we are happy to help you with the migration at our standard hourly rate, or you can authorize someone else to move it for you or do it yourself. No refunds shall be given for partial months. We have a strict no-refund policy on our hosting and security services. The content on your website is your exclusive content. InSync Media claims no rights or responsibilities for the content. You agree not to post or host any content on your website that violates copyright laws, steals someone’s intellectual property, or incites violence/cyber bullying. InSync Media will not be held responsible for the publishing of such content. We have the right to immediately take down any content we deem violates applicable laws as soon as we become aware of the issue. You will be notified if such action is taken. InSync Media regularly updates the theme files, server software, and plugins, and we perform a manual check on your website after major updates. We agree to make any fixes necessary after theme/plugin updates. In the event that a plugin is abandoned by its developer or becomes a known security risk, we will replace it with an better option. If a plugin replacement changes the design or incurs a subscription cost, you will be notified and the offending plugin will be deactivated while an agreement is reached on the appropriate measures before action is taken. 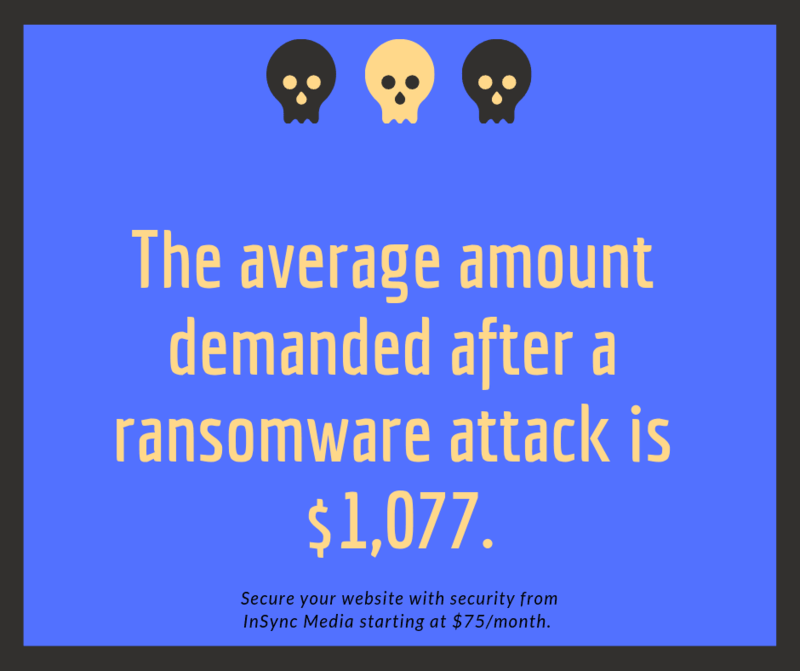 We make every effort to secure your website and our servers from malware, crypto-locks, ransomware, or other malicious activity. It is important for you to take the security of your website seriously by maintaining your own backups, not installing plugins without consulting with us, not sharing your passwords, adding additional users with generic usernames (etc: admin, administrator, sitename), and not allowing unauthorized users access to your website. If your website does experience a security threat, we will work with you to promptly address the situation and restore the security of your site in a reasonable time-frame. We perform a speed optimization on your website when you begin our hosting services. However, there are circumstances outside of our control that can and will slow your website down (uploading large files, images, videos, or other content, adding plugins or features). We backup your website hourly, daily or weekly, depending on your hosting service agreement. This allows us to get your website restored in the event of a crash or hack within 24 hours, unless we notify you that it will take longer for various reasons. You will receive monthly reports from us for your hosting and security services. If you have any questions or concerns let us know within three (3) business days of receiving the report. By paying us for utilizing our hosting services, you agree to the Hosting Terms of Service found here: https://terms.insync.media/hosting/. These may be updated from time to time at our sole discretion.